It’s the dream of every parent: the perfect family holiday, where tears and complaints are left at home, replaced by smiles and squeals of excitement. Well, we reckon it’s achievable; all you need is a bangin’ Hamilton Island itinerary. Hamilton Island Airport is connected directly to Sydney, Melbourne, Brisbane and Cairns. Hamilton Island is one of the easiest Great Barrier Reef islands to get to, and there are options to suit every budget. The most direct way is to fly to Hamilton Island Airport. Qantas, Jetstar and Virgin Australia offer flights from Sydney, Melbourne, Brisbane and Cairns. If flight times don’t suit or you want to see Airlie Beach on the mainland as well, book a flight to Whitsunday Coast Airport (also known as Proserpine Airport), and then get a shuttle or hire car for he 30-minute trip to Airlie. You’ll then need to catch a ferry to Hamilton from Port of Airlie or Shute Harbour. When it comes to accommodation, there are plenty of options depending on the age of your children. We can’t recommend Reef View Hotel highly enough, as it has everything from twin rooms to two-bedroom suites. There is also a large swimming pool and on-site restaurant that serves a great buffet breakfast. For somewhere quieter and suitable for self-catering, consider Hamilton Island Yacht Club Villas or Palm Bungalows. The affordable Bungalows on Hamilton Island are idyllic island accommodation among palm trees, perfect for families. If you have a teenager aged 16 or over and are keen to splash out, you won’t want to go past qualia, Hamilton Island’s most prestigious property, if not Australia’s! The sumptuous free standing bathtubs with a view of a Windward pavilion, qualia. In the meantime, adult children (18 and over) and their parents will love the serenity of Beach Club. The infinity edge pool at Hamilton Island’s Beach Club overlooks Catseye Beach. 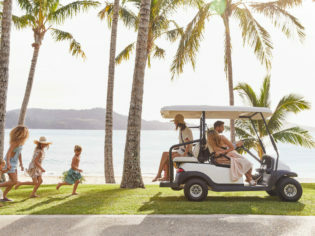 Now that you’re on Hamilton and bags are unpacked, it’s time to explore, and the best way to get around this car-free paradise is with a golf buggy. Rest assured that when it comes to getting around with kids, no mode of transport will put bigger smiles on their adorable faces than these open-air vehicles. 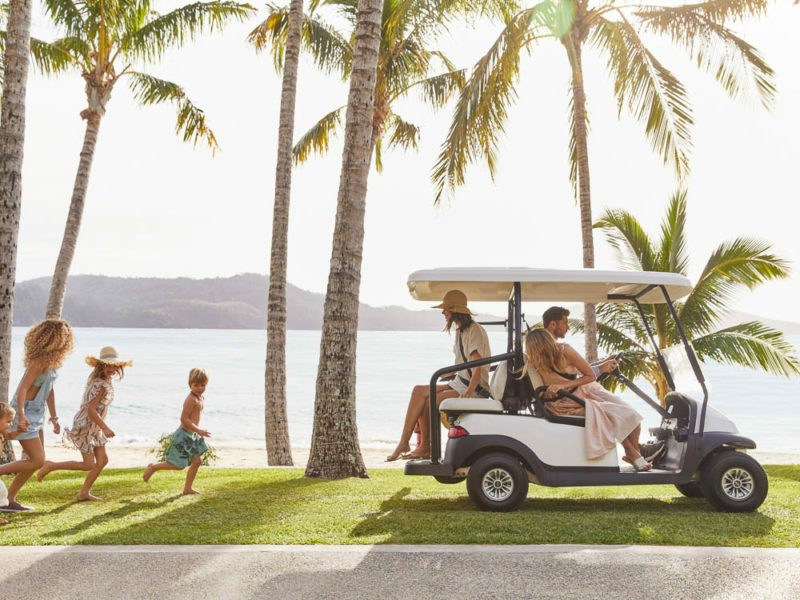 Book one with Hamilton Island Buggy Hire and be sure to request a child seat or capsule if you’re travelling with anyone under the age of four. Families are spoilt for choice when it comes to eateries at Marina Village but one place that will keep everyone happy is Marina Tavern. The Marina Tavern on Hamilton Island serves up relaxed pub food. Think generous pub meals in a laid-back atmosphere. For focaccias, juices and barista coffee, chill out at Marina Café, where you’ll find plenty of other families enjoying the easy-going vibe. After lunch, pop into Hamilton Island Ice Cream Parlour (after all, it’s highly likely the kids have already spotted it). All your classic flavours are available, along with double-dipped chocolate waffle cones, overloaded sundaes and milkshakes. Climb back into the buggy and make your next stop Catseye Beach, one of Hamilton’s main attractions. Burn off lunch with an afternoon swim or call into Hamilton Island Beach Sports for water-sports fun. Hire a catamaran, paddleboard, kayak, windsurfer or simply grab a mask, snorkel and flippers to explore the underwater treasures just off shore. If you want an injection of adrenaline, there are a tonne of activities to suit all ages. Family fun on the Great Barrier Reef. Float plane tours from Hamilton Island take you to a private slice of the Great Barrier Reef. Hamilton Island Watersports, at Marina Village, can take you parasailing, with all children required to be accompanied by an adult, and kids as young as four allowed to join in the fun. You’ll also have a hoot taking the kids tube riding, wakeboarding or water skiing, all of which are also offered by Hamilton Island Watersports and are offered daily. If neither of those takes your fancy, there are also jet-ski, jet-boat, fishing and sailing tours. After all of that action, you’ve earned some down time and one of the best places to enjoy it is atop One Tree Hill. Definitely do not leave Hamilton Island without enjoying at lease one sunset from the top of One Tree Hill. Roll out a blanket and snuggle up as you soak in the views of the Whitsundays as the sky turns tangerine. Parents can enjoy a glass of Champagne or cocktail from the bar, too. Before you fall asleep or are tempted by another beverage, take your buggy back down the hill to the marina for dinner. TAKO at Hamilton Island’s marina serves Mexican shared plates. For something a little different, grab a table at TAKO, where you can enjoy share plates of regional Mexican cuisine. Try the signature dish, octopus taco, and don’t be shy to ask about the kids-stay-and-eat-free deal. Share Mexican food on the deck at Hamilton Island’s Tako restaurant Marina. If you’re not a fan of Mexican, pull up a chair at Romano’s, where you’re guaranteed to find a pasta dish the kids can’t fault. Romano’s home made pasta with bruschetta is served on the deck overlooking Hamilton Island’s Marina. Or, if you’re there on a Tuesday, Thursday or Sunday, unfurl your picnic rug at Marina Daze and chow down on a char-grilled barbecue while listening to live music. Bliss. For the rest of your stay, all you need to do is eat, sleep and repeat. Or, you can try some of Hamilton Island’s other fun-filled activities. Check out our family-friendly guide here.